As I’m sure you’ve noticed, I’m a sucker for a good piece of art. Men, that’s easy. I like them confident, cleverly funny, and with a smart head on their shoulders. Classic or new age, screen-printed or hand-painted, black and white or color galore: I have no “type” when it comes to art. In fact, I may or may not have chosen to live in my teensy carriage house based on the fact that it had tall ceilings where I could create a killer gallery wall. I believe that you have to have an eye for art and that everyone’s eye is different (just like in choosing men). If I was forced to narrow down my style, I would say it is bold and eclectic. I like that no piece matches another and that there is never a theme throughout my collection work (unless of course, it’s accidental!). 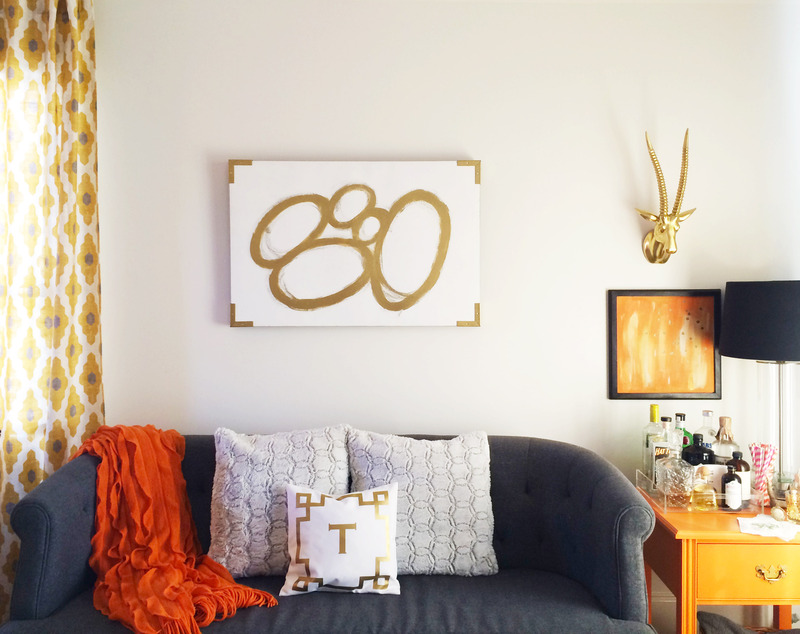 Today, I’ll be sharing my tips for hanging art, along with designer and blog-guru Erin Gates’ tips from her book, Elements of Style. 1. The Statement (as shown in my living room above) – Use one piece of art that is large enough to anchor the room and make a lasting impression. Artwork that is too small will get lost on a large wall. This particular piece was DIY-ed after a piece of artwork on one of my favorite blogs. I added the spray painted corner brackets that I found at Ace Hardware. 2. The Leaner – For a more casual look, lean a grouping of artwork on a shelf or mantel up against a wall. Layer the frames over-top one another for a cohesive look. 3. The Gallery Wall (as shown as in the first image above) – You may not know it, but gallery walls are surprisingly simple. The best come from simply winging it with no measurements at all. Erin’s tip: trace all your art on newsprint and arrange them on the wall with painters tape first. Then let the hanging begin. 4. The Grid – Arrange matching frames in a grid for a crisp look (a grid of black and white photos is my fav!). For smaller frame sizes, keep each 1-2 inches between frames. Larger frame sizes can have up to 4 inches between frames. 1. 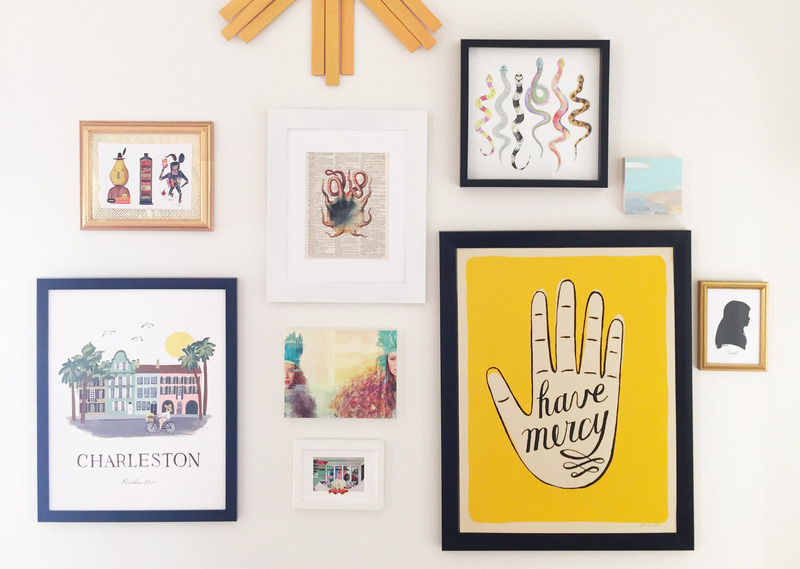 Balance – I like to keep the largest pieces of my gallery wall near the bottom of the grouping. Visually, these pieces carry a lot of weight so you don’t want them “squishing” a smaller piece of art. Balance sizes and colors throughout your wall rather than grouping them. Also keep an eye out for the type of art you are displaying. Balance abstract art, photography, drawings, etc. 2. Think out of the box – Ditch the frame. Adding unframed pieces to your collection can add dimension. 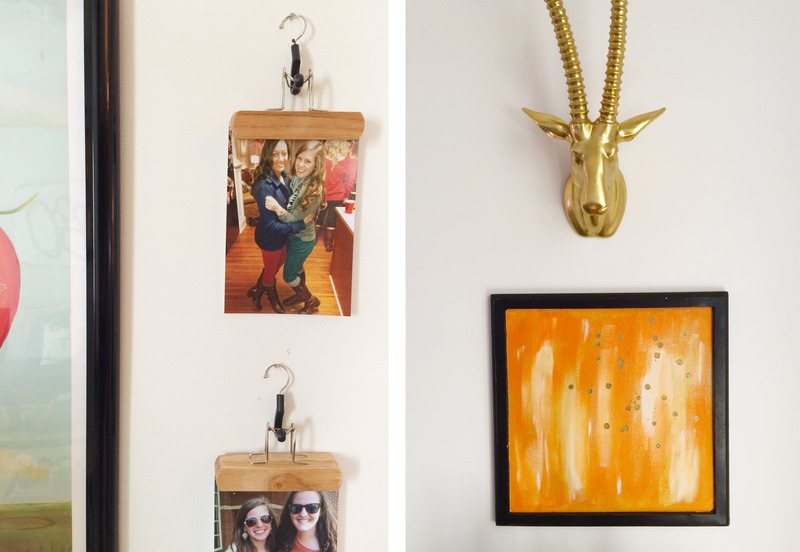 Try using metallic animal heads, gold urchins, mirrors, or photo hangers (pictured below, find at Target) to add interest. 3. Stick to a theme when framing – using all the same frame type can give you a unified and tailored look. On the opposite end of the spectrum, using all different types of frames can give you an eclectic feel that will unify itself on the wall. Questions on the techniques or images shown? Comment below!